1. TQM - Total Quality Management is a management technique that describes the attitude, culture, as well an organizational structure that strives to offer clients services and products that satisfy their need at the lowest cost possible. 2. FMEA – Failure Modes and Effects Analysis is a step-by-step technique for identifying all probable causes of failures in an assembly line, a manufacturing or a product design process. 3. MSA – Measurement System Analysis is a mathematical and experimental technique of determining the degree of variation in a process. 4. Innovation – The process or action of creating a new product or process. 5. 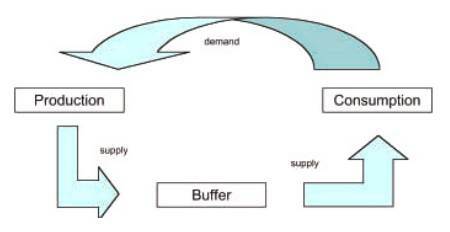 Function – A relation between inputs and outputs with the assumption that every input is related to one output. Kaizen and Six Sigma are regularly used together because they endeavor towards a common goal; process improvement through identification and eradication of waste. However, it is important to note that they are two different management techniques. Kaizen and Six Sigma can be implemented in isolation to deliver process improvement. For example, since 2006, Motorola has saved more than $17 billion using six Sigma and kaizen. More than 50% of the Fortune 500 firms including Honeywell, and General Electric use Kaizen and six Sigma. Canon and Toyota have both reported increases process efficiency and saving money by adopting kaizen. Kaizen and Six Sigma works the best when used together. Six Sigma was introduced in 1986 by Bill Smith, an American engineer, while working at Motorola. In 1995, Jack Welch, the chairman and CEO of General Electric, a chemical engineer and an author, made it a key part of General Electric business management techniques. Today, it is hot than ever and nearly every organization is adopting some form of Six Sigma management. Six Sigma is a focused, rigorous, and a highly effective method of implementing proven quality improvement techniques and principles. It draws together elements from works of proven quality pioneers, and its aim is to achieve error free business processes. On the other hand, Kaizen is an effective, proven method of making continuous improvements. Six Sigma depends heavily on tried process improvement methods that have been in use for decades. In fact, it disregards complexities that surround methods such as TQM. Six Sigma takes a small number of proven quality improvement techniques, and trains a small number of in-house technical leaders – also called Sig Sigma Black Belts – to become specialist in adoption and implementation of the chosen techniques. Some of the techniques that Sigma Six Black Belts apply to improve performance are advanced, and normally they entail being up-to-date with computer technology. However, Six Sigma tools are implemented using a simple performance Model, popular as the DMAIC (Define, Measure, Analyze, Improve, and Control). Measure and record the status of the current system. Analyze the current system to figure out ways to bridge the gap between the current state and the desired process state. Improve efficiency of the current system. Design control measures for the new system. Joseph M. Juran, a Romanian-born American management consultant and engineer, defined Six Sigma to mean the use of a scientific process to design business processes and to operate management systems to allow workers to deliver the best value to customers. 1. Observe some significant aspect of your organizations or markets. 2. Develop a tentative hypothesis or explanation, consistent with your observations. 3. Make predictions based on this explanation. 4. Test your predictions by carrying out experiments and/or thorough observations. Record your observations. Change your explanation based on the new information. If there are variables, use statistical tools to help you separate signs from noise. 5. Repeat the 3rd and 4th steps until there are no differences between the explanation and the outcomes from observations or experiments. At this point, you will have a viable theory explaining a vital relationship in your organization or markets. The theory is often clear and can be used to improve performance or forecast the future of your business. 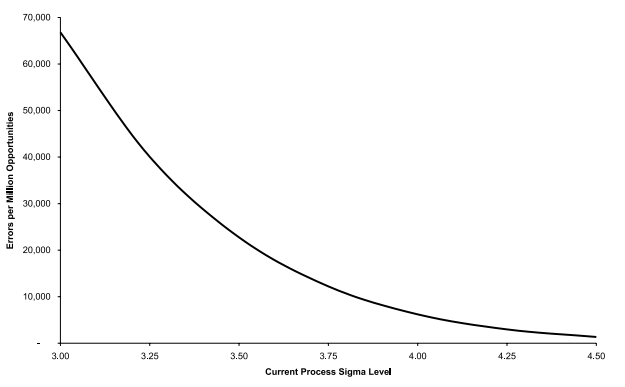 Just like kaizen, Six Sigma reduces errors in the production process. This is illustrated in the graph below which depicts errors per million opportunities vs the level of Sigma 6 adoption. Six Sigma can make breakthrough changes in existing processes. However, cost savings from these breakthrough projects are not always realized. The reason for this is the non-existence of small improvements, and maintenance in six Sigma organizations. Note that six Sigma advocates for development of standard operating procedures and ensuring that all employees follow them. This is a huge setback because without consistent monitoring and continuous improvement, processes normally deteriorate. But if an organization adopts a hybrid system made up of Six Sigma, a strict adherence to established processes, as well as a team that is continuously looking for ways to improve the processes (Kaizen), it attains optimal performance. Such a system puts a business in a better competitive and financial position because in addition to the breakthroughs brought about by Six Sigma, improvements happen on a continuous basis. In short, Six Sigma supplies the analytical rigor and discipline necessary to clearly understand the nature of problems and processes, and to find effective solutions. However, it does not promote a learning culture and as such, cannot be used as a substitute for Kaizen. In fact, it works best when combined with Kaizen. The collective insight of the team, combined with different risk management tools and analytical tools such as failure mode and effects analysis (FMEA) and measurement systems analysis (MSA), help to reduce the risk of below par decisions in the DMAIC process. Without the use of these tools, Kaizen would just be a technique similar to the nonproductive total quality management (TQM) approaches that forced the evolution of Six Sigma. Initially, the hospital management had set a process for pump availability, but the employees continuously shared their frustrations of not getting pumps when they need them, which increased patient care time. Once located, the pumps were always dirty or broken leading to more wasted time cleaning them. A Six Sigma team was set up. The team designed a process for storing, cleaning, and even distributing these pumps which immediately reduced the wasted time. This means that under the new system, patients receive care quickly, and that employees are less stressed, meaning they are more satisfied with their work. Leadership, creativity, and innovation – This shell aligns deployment and strategy, drives cultural change, and mentors the firm through the ideal path. In other words, when management understands Kaizen and Six Sigma, it's able to provide clear instructions on what should be done to improve competitiveness and profitability. Employee and team involvement – When employees understand the need for improvement; they have the right tools, and the power to take the necessary steps. Closed-loop performance – This shell pegs process ownership and accountability. Real-time results measurement also allows employees to better understand the cause and effect relationship between their actions as well as the improvement objectives. There is a big difference between the Six Sigma and the concept of Kaizen. First, Kaizen has its origin in the ancient Japanese philosophy. When it was first coined, the idea was to constantly work toward perfection in different areas of an individual's life. It was first used in an organization sense after the WWII. On the other hand, Six Sigma is a much newer change concept that originated around the early 80's. Kaizen is often an overreaching type of process improvement that aims to improve all areas of an organization through standardizations, eliminating waste, and increasing efficiency. Six Sigma is a process specific improvement method that focuses on enhancing the quality of the product. This is often accomplished by examining the probable causes of low quality products and eradicating the root causes of these failures. Instead of reviewing all the process (like Kaizen), only those affecting the quality of the final product are examined. When Kaizen is integrated into an organization process, the focus on enhancement has a wide scope. The function of every worker is reviewed regardless of his or her level (top management, middle level management, line management or tactical level). On the other hand, Six Sigma is often more mathematical in its focus and needs a measure of processes variation from perfection. It is deeply rooted in mathematical equation and analysis. Its objective is to realize zero defects when the project is completed. Despite these differences, both concepts can help an organization save a lot of time and money. And they work best when adopted together. 1. Perfection – The state, quality, or condition of being as free as possible from defects or flaws. 2. Buffer – A thing or person who prevents antagonistic things or people from coming together. 3. Batches – A number or quantity taken together or coming at a single time. 4. Turnover – The amount of stock sold at a particular time. 5. Vision – A technique used to clarify, maintain focus, and concentrate on a specific objective. As Peter Drucker, an Austrian-born American author, management consultant, and educator. Says, "The single most important thing to remember about an enterprise is that there are no results within its walls; the real result of a business is satisfied customers." The element of CF has been gaining popularity in recent decades as organizations realize the benefits of concentrating on customers' satisfaction. In a fully customer-focused organization, all business activities are informed by customers' needs and are designed to improve their experience. 1. Leadership – Communicates with the customer, keep customer satisfaction scores, and determines future expectations at all major briefings. 2. Strategic planning – Links strategies, objectives, customer expectations, balanced set of measures, and business priorities. 3. Customer focus – Focus on key customers and their families. 4. 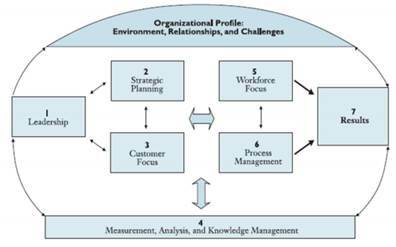 Measurements, analysis, and knowledge management – Involves balanced measurement where products are aligned with the customer management and expectations. 5. Workforce focus – Development and training efforts to improve information skills, customer service skills, and product appearance. 6. 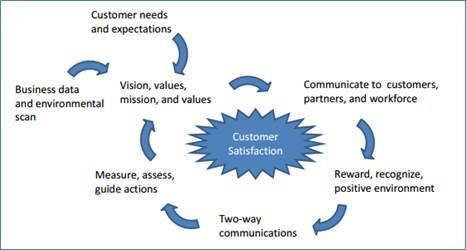 Process management – Customer services as well as satisfaction metrics are linked to different business processes. 7. Results – When customer expectations are incorporated into the business process, then the results will follow. CF is a primary source of sustainable competitive advantage. It enables the organization to understand its customers and align its strategies, people, and systems to deliver exactly what they want, when they need it. From the above discussion, we can now define CF as an approach towards achieving organizational success by aligning processes, activities, and systems around a common goal –customer satisfaction. An organization can decide to focus on different things such as internal processes manufacturing efficiency, new product development, etc. But while these things cannot be ignored, it's the CF that ensures that the firm is delivering the needs of those individuals that keep them in business. It is vital that a customer-focused organization has a clear strategy, vision, mission, and value proposition that have been informed by client's needs. From this basis, all aspects of the firm can be aligned to deliver to ensure customer satisfaction. JIT manufacturing process has been adopted successfully in Japan. It is a technique and a philosophy that guides a manufacturing firm in managing and organizing its business more effectively, and in controlling and planning its operations more efficiently. It is a technique for realizing high-velocity manufacturing (HVM). HVM aims at eliminating waste associated with labor, storage space, and time. Basics of the HVM, hence JIT, are that the organization produces or orders only what is required, when it is required, and in the amount that is required. The firm manufactures only what the consumer requests – the actual orders, not the projected orders. 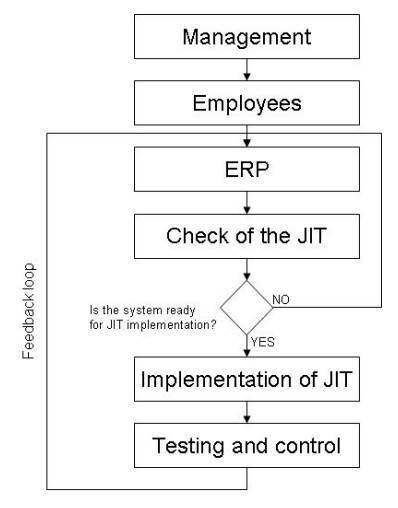 JIT was first developed and implemented within the Toyota producing plants by Taiichi Ohno, a Japanese engineer, as a means of satisfying customer demands with minimum delays. The management must accept the idea of JIT. The employees must understand the importance and benefits of JIT. After the human resources factors have accepted the idea, the implementer can continue with the other steps. In today's industrial world, huge wastage occurs on the production shop floor. This waste arises due to maintenance personnel, operators, tooling, and processing problems as well as non-availability of elements at the right time. Other types of waste include idle manpower, rejected parts, broken down machine, idle machines, etc. This type of waste is normally eliminated using a Kaizen technique called TPM. TPM can be defined as the medical science of all machines. It brings maintenance into focus as a vital and necessary part of the organization. In TPM, machine maintenance is regarded as a profitable activity, and downtime for maintenance is treated as part of the production day and in some situations, as an important part of the production process. The end goal of TPM is to avoid unscheduled and emergency maintenance. As you will see from the table below, scheduled maintenance increases productivity in an organization. The table shows an ordinary maintenance craftsman's day without planning for maintenance and when there is a planned schedule for maintenance. As you can see, the craftsman waste more time (65 %) and leaves less time (35 %) to do the maintenance work when there is no planning. With planning, the situation is reserved and thus become more productive (65 %) and less wasteful (35%). · Adoption of a life cycle system for improving the performance of manufacturing equipment. · Improving productivity through motivating employees – job enlargement. · Use of small group activities to identify the origin of problems, possible equipment and plant modifications. Teamwork is a vital kaizen tool. Just like a football team working together to score the perfect goal, all team members have specific roles to play in completing tasks on the job. Although it might seem as if one guy scored the goal, that goal was made possible by eleven players' cooperation, coordination, and planning to get the ball to that player. The element of Teamwork is closely related to the concept of quality circles. A QC is a small group that performs quality control task within the workshop. Just like Teamwork, QC has become one of the main tools for implementing Kaizen in an organization. Employees working on a certain process come together to review the task they are completing and to make suggestions for improvement. It enhances employees' sense of belonging towards the organization and their jobs. It taps and recognizes the intellectual potential of employees. It offers structured opportunities for training employees to become actively involved in solving problems. It is owned by the employees, not the managers. It is a cost reduction technique. Continuous improvement is an area where the IT department can really help by continuously searching for ways to shorten cycle times, improve process efficiency, and reduce costs. Automating regular tasks reduce cycle times, eliminate waste and improve quality of products. It creates a systematic approach for Kaizen implementation. However, automating without first solving problems does not lead to optimal solution – it can never be efficient or straight. Automation works best when complemented by other Kaizen techniques. It is usually a scheme of employees' participation in the process of making decision on matter not covered by the employer-employee bargaining agreements.